S. Augustus Mitchell Jr. This beautiful hand coloured map from the famous Mitchell's "New General Atlas" represents some of the most attractive and accurate maps of the era. Includes 'Russian America', 'Danish America' and 'British America' and recent discoveries in the Polar regions. S.A. Mitchell Jr. took over his father's famous map publishing business in 1860. 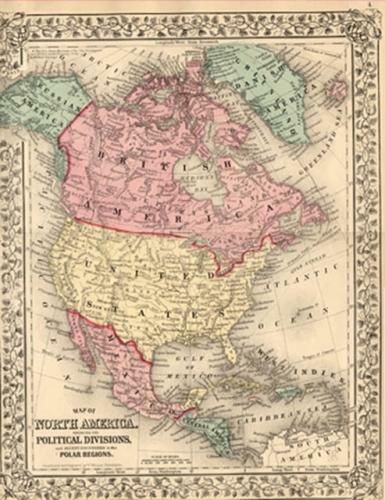 S. A. Mitchell Jr. produced the "New General Atlas" in 1860 and the firm contiuned until about 1892 as one of the most prolific American map publishers. This map of North America is very detailed with an attractive, ornate border and is in very good condition.